Our products have been specified on four new high profile projects for 2018 – three office refurbishments and a new changing area for Third Space in Soho. 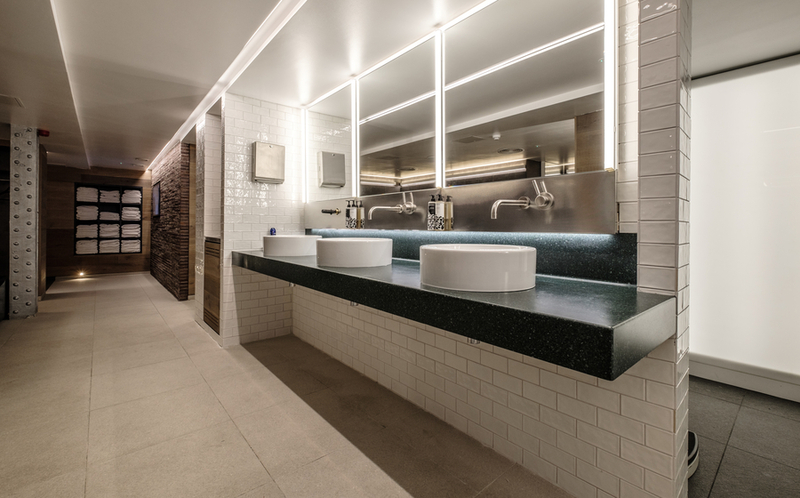 In the City of London and Mayfair districts respectively, we’re refurbishing the existing washrooms at two listed office buildings with designs intended to reflect and complement the heritage and style of each building. The stunning post-modernist style office and retail building at One Poultry was the last building to have been completed by James Stirling and since been granted Grade II* listed status. With its distinctive stripy façade and rounded clock tower, it’s a well-known landmark in the City and is currently undergoing a refurbishment by Paragon and Buckley Gray Yeoman architects. As well as the new washrooms on all levels of the building, we’ll also be creating a staff shower area featuring our Forza solid grade laminate lockers and bespoke benching. Corian island vanity units, bespoke black framed mirrors, black ancillaries, Corian skirting and bespoke door sets have all been designed specifically to make the building stand out. In Mayfair, we’re working with BW Workplace Experts to design and install new high specification washrooms for a five star, Grade II listed serviced office building at One Heddon Street. The project will involve the installation of Alto full height toilet cubicles with an attractive Douglas Fir finish along with bespoke Corian vanities, duct panels with stone and bespoke ancillaries. In the next few weeks, we’ll be starting work with Opus 4 on another office refurbishment project on Norwich Street in the City, just around the corner from 98 Fetter Lane, which we refurbished with Cre8 Joinery two years ago. We’ve created the washroom design in-house and it features the same eco-friendly Bamboo finish on our Marcato toilet cubicle doors as at the Fetter Lane project. The design, which is to be rolled out for the washrooms on the ground to sixth floor, will also feature glass urinal ducts and Corian vanities. We’re also in the midst of a project with Vincent Stokes and Goldstein Ween architects for luxury health club brand, Third Space, in Soho, following our work at the Tower Bridge club two years ago. Third Space has five clubs in London, each with its own unique interior design featuring unique finishes throughout. The new changing rooms feature a mix of stainless and galvanised steel together with solid surface HI-MACS® to create a unique space which would not be out of place in a boutique hotel. The high specification Havwoods engineered oak wood veneer wall cladding and unusual framed shower frontage with ribbed acrylic panels compete the bespoke stylish design. Make sure you keep checking our social media platforms for updates as these projects progress over the coming months.